Aromatherapy is a branch of herbal medicine that uses medical properties of the essential oils of plants and herbs. The essential oils in Aromatherapy are plant volatile oils from flowers, leaves, stems, branches or roots, extracted by steam distillation or cold pressing. The use of essential oils can be dated back to ancient times in Egypt, India, China and Italy, with many references through out the bible. Each essential oil has a pharmacological effect on the different systems of the body such as antibacterial, antiviral, antiseptic, antidepressant as well as tranquilizing. Promoting physical, psychological and spiritual well being. When an essential oil is inhaled it stimulates the Limbic system in the brain. That part of the brain that influences memories and emotions and is directly linked to our pituitary gland, adrenals, the hypothalamus, the parts of the body that regulate heart rate, stress, blood pressure, hormone balance and breathing. This makes the effects of essential oils immediate in bringing about emotional and physiological well being. 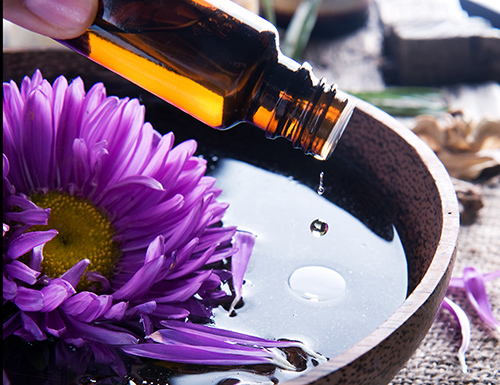 Essential oils can be applied by massage, or used at home in a bath, diffused, or added to a spray bottle. At Abbotsford Yoga Studio we offer many different therapeutic grade essential oils that can be purchased individually or blended specifically into a cream for topical use, added to bath salts or a customized spray for home or office use. Eileen is a Certified Aromatherapist with product development knowledge. Graduating from the BC Institute of Holistic Studies in 2006, ensuring quality of care, product knowledge and safety in finding the right oils for your well being taking into consideration health history and lifestyle. improve energy and reduce fatigue.